Every year the Ford School organizes a two-day trip to Washington, DC that allows master’s students to explore policy careers while learning from and networking with Ford School alumni who live and work in the nation’s capital. The trip brings together Ford School students with a diverse array of policy interests, and taps into and strengthens the school’s growing alumni network. This year’s event took place on Thursday, February 9 and Friday, February 10 and drew 42 students and over 100 alumni participating in the reception, lunches, and panels. "It is always inspiring to see the ways in which alumni stay connected to the school and are so willing to give back to the next generation of Fordies," says Jennifer Niggemeier, director of the office of graduate career services and alumni relations. Click here to view the Flickr album with photos from the trip. Panels on careers in “research and evaluation,” “strategic communications,” “refugee and migration policy,” “domestic social policy,” “philanthropy,” and “international organizations” took place on the first day of the trip. Careers in “domestic social policy” was the highest attended panel and included alumni working at the Center for the Study of Social Policy, the Center for American Progress, the National Governor’s Association, and the U.S. Department of Housing and Urban Development. The panel provided unique insights into domestic social policy careers in light of the new political administration. “The panelists spoke frankly about how the new administration was impacting their organizations and work,” says Bilal Baydoun (MPP ’17). The second day of the trip began with panels on “careers in consulting” and “navigating transitions in DC” and ended with a range of lunch-and-learn sessions on “education,” “energy and environment,” “corporate social responsibility/international development,” “advocacy,” and one session hosted by alumni working at the U.S. Office of Management and Budget. Jonathan Beam (MPP ’18), who attended the “advocacy” lunch and learn session, was particularly curious about how advocacy has changed in the administrative transition. He found the alumni’s informal and “unvarnished” take on the political challenges of their advocacy work uplifting. “It was interesting to hear each of them talk about the strategies they employ in their work. Political and partisan swings are just part of the job, but they emphasized that their organizations are adaptive and are prepared to engage in the new political climate,” Beam says. Elisabeth Johnston, the Ford School’s alumni relations manager, was particularly struck by the enthusiastic and engaged participation of the alumni who attended the event this year. 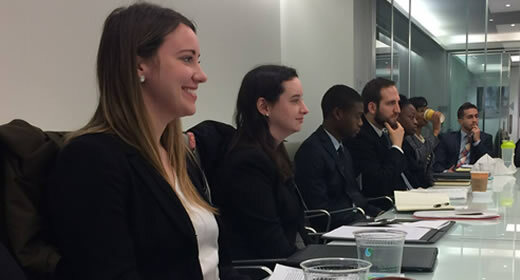 “From alumni on panels, to reception hosts and attendees, to lunch hosts—all were excited to be asked and really brought their ‘A games’ when answering students' questions, offering advice, and discussing policy issues as they play out in DC and at their organizations,” said Johnston.